Off the western coast of Scotland lie many islands known as the Hebrides; the group farthest to the northwest is called the Outer Hebrides, and three of these islands were North Uist, South Uist, and Benbecula – west of the Isle of Skye. 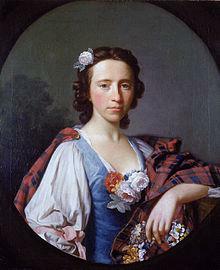 Flora MacDonald was born in 1722 in Milton, South Uist, to a well-placed family in the MacDonald clan. Flora was brought up on Skye, and received some education – the young people of the island were gathered into conveniently placed schools at various points, where a teacher from the mainland gave instruction. Among the farmers and their families, Flora had many friends, and learned to sing Gaelic songs. She grew up hearing many stories about Scotland’s past, including the story of King James II, a Catholic king of England and Scotland, who was removed from the throne and exiled in 1688 by Protestants who feared the influence of a Catholic king. Many Scots remained hopeful that someday King James’s son would return to lead Scotland. This son, James Francis Edward Stuart, tried to regain the throne but failed. The burden then fell to his son, Charles Edward Stuart, called Bonnie Prince Charlie. The Scots who wished for the return of a Scottish king called themselves Jacobites, in honor of King James. They talked about the day when Bonnie Prince Charlie would return to Scotland and regain the throne. Flora MacDonald lived quietly for seven years, when she was taken into the mansion of the Clanranalds, of which her family were cadets. Four years later, she went to Edinburgh with Sir Alexander Macdonald and his wife to continue her education. For six years, Flora lived very happily in Edinburgh, and then returned to Skye. In 1745, Bonnie Prince Charlie arrived in Scotland and quietly organized supporters. He then started a rebellion in Scotland in an effort to regain the throne. After a few successful battles, Prince Charles and the Jacobites suffered a horrible defeat in a bloody battle at Culloden. Following the battle, King George II of England issued orders to torture and punish those who had helped the prince. And Prince Charlie needed to get out of Scotland quickly before he was killed. The whole area was filled with soldiers searching for him. Flora MacDonald was staying with the Clanranalds in Benbecula when the Prince arrived there, in imminent danger of capture. His only chance to escape was to leave the island in disguise. 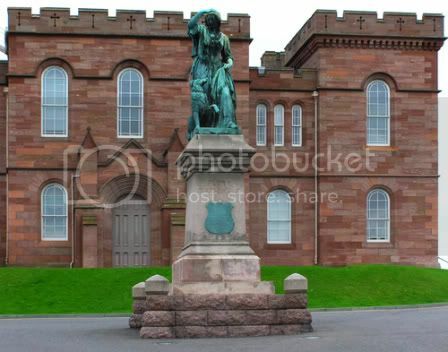 Many people helped Prince Charles, but it was Flora Macdonald who perhaps helped him most. No house was safe for him, and he had to hide among the rocks of the seashore, shivering with cold and drenched with rain. He scarcely dared to leave his hiding place, and was almost dying of hunger. 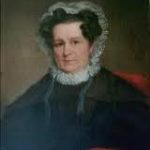 The commander of the local militia was Flora’s stepfather, Hugh MacDonald, and he gave her a pass to the mainland for herself, an Irish maid named Betty, and a boat’s crew of six men. With great danger to herself, Flora arrived at the place where the Prince was hiding, and brought a dress for the Prince to wear. They went to the house of a friend, where Flora asked if she and her maid Betty might stay the night. This friend was very fond of Flora, and she was also a Jacobite. When she was told who Betty was, she gave the Prince her best room. A little girl came into the hall while Betty was standing there, and ran away frightened at the great tall woman, but none of the others in the house suspected who she was. Disguised as Flora Macdonald’s maid, Prince Charlie traveled for many days, escaping many dangers. The king’s men followed them closely and gave them no rest. The trip was dangerous, and they spent many days tired, hungry, and soaking wet from the Scottish rains. Flora could have left the prince and returned home, but she refused. After several weeks, the prince found a ship that took him to France, they said a sad farewell of each other. When she returned home to the Isle of Skye, Flora was arrested by the English for aiding the prince in his escape and taken on a long sea journey to London to await trial. Conditions on the ship were horrible, but she charmed the crew, and the captain of the ship wrote a letter requesting that Flora be kept out of jail. After a short imprisonment in the Tower of London, Flora was kept in a private home with several other clansmen, rather than in a jail. Flora made many friends among the English Jacobites, who came to visit her regularly. They knew her story and felt privileged to spend time with such a brave young woman. Flora returned home two years later, with many friends and a sizable fortune raised for her by the English Jacobites. She never stood trial. 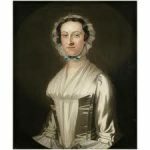 In 1750, Flora married Allan MacDonald, Laird of Kingsburgh, who described her as a woman of soft features, gentle manners, and an elegant presence. They lived at Flodigarry in Scotland for many years and had seven children. The family went into great debt because of high land rents, and bad weather ruined their crops. Things were desperate for the MacDonalds and many others throughout Scotland. In 1774, Flora and Allan decided to emigrate to North Carolina, where they believed they could begin a better life. Before they were allowed to make the voyage from Scotland, they had to take an oath, along with all the other Highlanders from Scotland, to remain forever loyal to the British Crown. They landed at Wilmington in the fall of 1774. 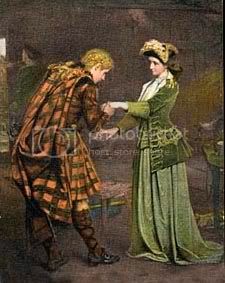 There, they found a substantial Scottish population, most members of whom were aware of Flora MacDonald’s efforts to save the prince. She was quite a heroine in North Carolina among the Scots. The MacDonald family settled on a plantation called Killiegray in Anson County. The American Revolution was fought not only by armies. Everyone who lived in the colonies was part of the war for independence. North Carolina women contributed and suffered much on both sides of the war. At that time, the population of North Carolina was mostly rural. Men lived with their wives and families on farms. Like women everywhere in those days, the farmers’ wives had established roles within the family. As tensions grew between the colonists and the British government, North Carolinians divided into three groups: the Loyalists (who supported the British), the Patriots, and those who did not take a stand either for or against independence. The last group included pacifists like the Moravians and Quakers, who were neutral because of their deeply held religious objections to war. Each group had women who served and suffered during the Revolution. The MacDonalds soon learned about the growing conflict between colonists and King George III. Although they tried to stay out of the trouble, eventually everyone had to choose sides. In 1775, royal governor Josiah Martin tried to raise a small North Carolina Highland regiment to fight the Patriots, in which Allan MacDonald became a major. Along with his son and son-in-law, he was part of the 1600 North Carolina troops who marched off to join the British army. Before they left, Flora, riding a beautiful white horse, came to the camp to cheer the men on. She called on them to fight bravely and remain loyal to the king. Flora rode with them during their first day’s march, and spent the night with them before returning home. On February 27, 1776, at the Battle of Moore’s Creek Bridge near Wilmington, the Highlanders encountered the North Carolina Patriots, who had taken the planks off the bridge and greased the side rails. As the Loyalists tried to cross the bridge, Patriot soldiers shot at them and killed many. The entire ordeal lasted only a few minutes, but all were killed or captured. Of more than 700 prisoners, the private soldiers were released on parole, the officers, including Allan MacDonald, afterward were exchanged as prisoners and sent to Halifax, Nova Scotia. Their son and their son-in-law were jailed. Courageously, Flora visited and comforted the families of others whose men had been killed or captured. Flora was devastated — her life in North Carolina had come to a close before it had really begun. She had to face the anger and violence of local Patriots with the help of her remaining son. Their plantation was robbed, and Flora fled to her daughter’s home nearby. The state government seized Killiegray, and Flora MacDonald was left homeless and nearly penniless. She eventually left America for Nova Scotia. On Allan’s advice, Flora returned to Scotland on a merchant ship in 1779. On the voyage, the vessel was attacked by a French privateer. Flora displayed great bravery, and insisted on remaining on deck, where she got her arm broken in the fight. She reached home safely, and settled down to await her husband’s return. Allan was finally able to join Flora after his release from prison in 1783, and they lived at Kingsburgh on the Isle of Skye for the remainder of their lives. After living through glory and hard times, Flora MacDonald died March 4, 1790, at the age of 68. She was buried in the graveyard at Kilmuir, just two miles from the spot where she and Prince Charles reached safety in 1746. Her death was deeply mourned by the people of Skye. It is said that more than 3000 attended her funeral, at which 300 gallons of whiskey were drunk. 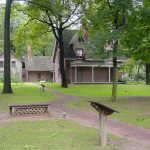 Although Flora MacDonald lived in North Carolina only a short time, her legend took hold within the Scottish population there, and has continued as an important symbol of North Carolina’s Scots history. Her legend continues today as a story of bravery, romance, and loyalty.